Wouldn’t we all love to peer inside the minds of our customers to see how we could better reach them and serve their needs? With Google, you actually can—to an extent. 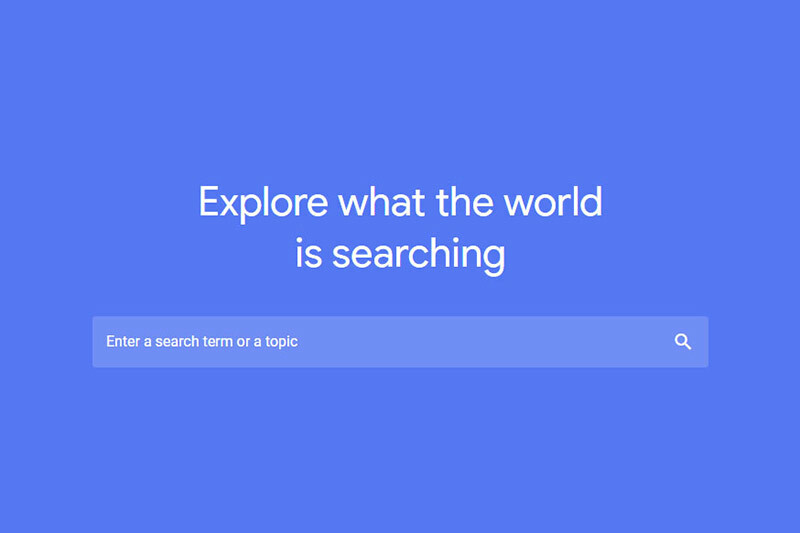 Google Trends is an online resource that anyone can use to research and compare terms to get statistics on how frequently they’re searched. This tool shows what macro trends are going on that may be overlooked otherwise. 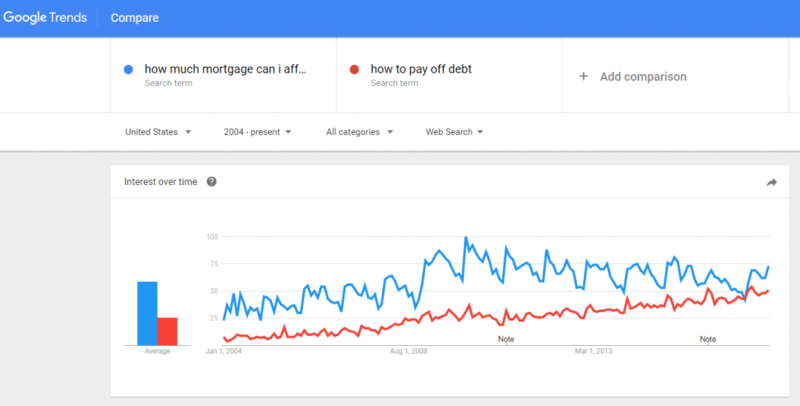 A new report by Chase Home Lending reveals something interesting about the relationship between what we search online, and what’s going on in the grand scheme of things. The Chase study shows that Google searches related to buying a first home rose 11 percent over the last year, despite reports of anxious millennial buyers opting to rent instead of buy. This is combined with the fact that new purchasers make up 42 percent of all buying, which is up from 31 percent during the 2011 housing trough. It seems a paradigm shift is occurring. Despite all this growth, a Harvard Housing Report recently revealed that over 38 million American households are cost burdened by home payments. This is a 146 percent increase over the past 16 years. So, what does this all mean? It seems that despite the fact that Americans can’t necessarily afford it, they are actively opting to purchase rather than rent. And Google search data are supporting this trend. The number of searches related to how to afford housing increased 34 percent in 2016 compared with the previous year. It should be alarming that there’s a continuing positive correlation to this trend. 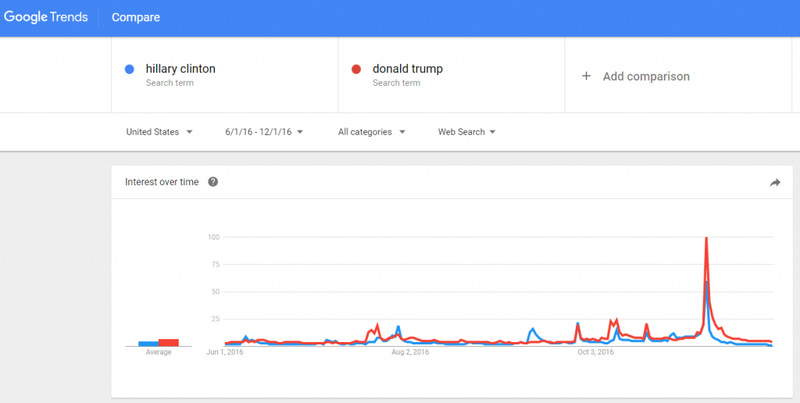 The Google Trends tool gives indices that can let analysts peer into an unfiltered look at what people are searching for. Predictive Analytics can be incredibly useful for entrepreneurs looking to make their next big move. This tool can be geo-targeted and adjusted for a custom timeline. 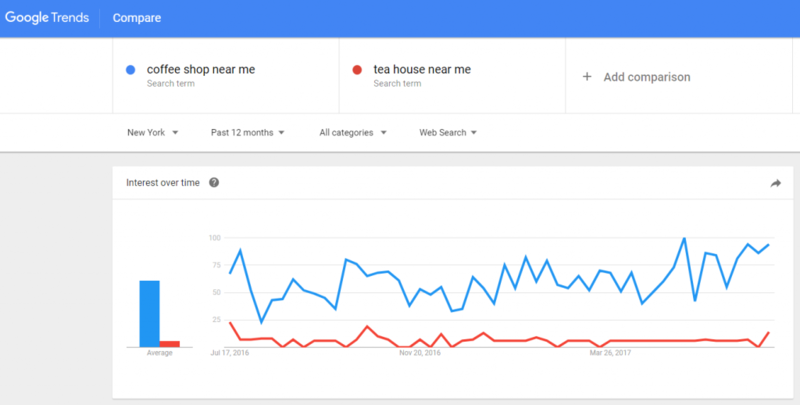 Looks like New Yorkers are more inclined to search for a place to get coffee, rather than tea. Interestingly, you’ll find slightly different results if you target New Jersey. Now before we get into the game of predictions for the 2020 election, this theory doesn’t check out for sitting presidents. 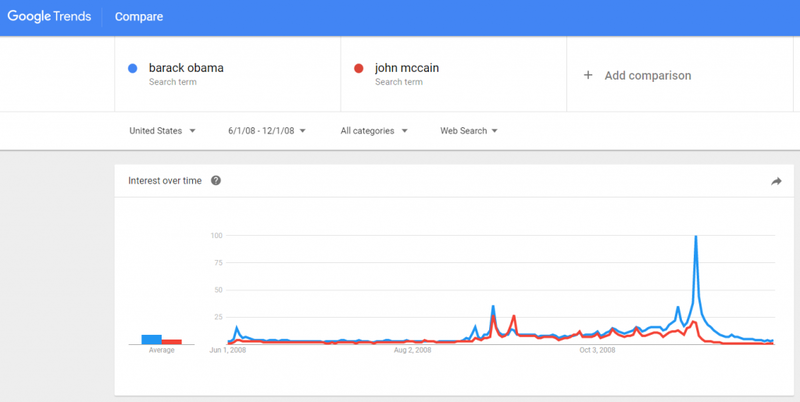 Presumably because people already know about the President’s policies, their rival seems to be Googled more. Still, the data is free and open to the public, and picks up on data the polls are missing. So, before you take the plunge and open up a new business or break into an industry, a little digging can go a long way to find potential or pent-up demand. This tool also reveals seasonality your business may experience, as it shows peaks and troughs over time. When we advise clients on search engine optimization, we typically utilize this tool to determine which keywords will land them the highest return on investment. We personalize each client’s account to help them achieve their goals, whether it’s influencing the first page of Google Search results, or increasing their visibility online. This entry was posted in Interact Marketing Blog, News. Bookmark the permalink.